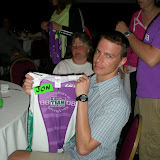 The story of this race weekend began when we learned the event sold out days before Mike W got around to registering. He couldn’t race which is a shame because he probably would have won our age group; he would have had a solid shot at winning the men’s overall as well. Heading to Waco was still a homecoming of sorts since Mike’s a Baylor grad. We tooled around town, saw the bears in their habitat on Baylor campus, and had our pre-race ritual of Olive Garden pasta. The Tri Waco Spint & Olympic Triathlon is the first event produced in this city since the early 90’s. Years ago, a 15 year old Lance Armstrong was a triathlon prodigy and won the course. It’s a great venue for a race. I can’t figure why the long absence of events. Demonstrating how this sport continues its viral growth, another old friend of Mike’s, Dusty, ran his second race today with his wife and three young kids in the crowd to cheer him on. Dusty did great. I’ve done something like 10 races and I barely stayed ahead of Dusty today. We finished within a minute of each other. Weeks of morning SPIN classes seemed to have paid off in an improvement of my bike performance. Weeks of neglecting the pool and binge training for the run showed up my results too. My time was 1:27:39. 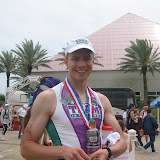 I’ll need big improvements in my run time and a smarter strategy for open water swimming to hit my stated goal. 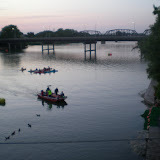 We all agree that the Tri Waco is an event we’d like to do in 2010. Especially since Mike was locked out this year! My name is Laura Remson, and I am a staff writer with The Baylor Lariat. I was doing some research for an article I’m writing on the TriWaco, and your blog popped up. I enjoyed reading your blog and your thoughts on the event. I was hoping to put some of your quotes in our welcome back issue. If you would like to e-mail me, it's laura_remson@baylor.edu. I just have a few questions. Thanks again for all of your time, and congratulations on the event! Cool, I'm glad you enjoyed the post. I'll reach out via email to see if I can help with your article.